If you are an Amazon Prime subscriber you can watch ten Thursday Night Football games this year on a wide array of devices. 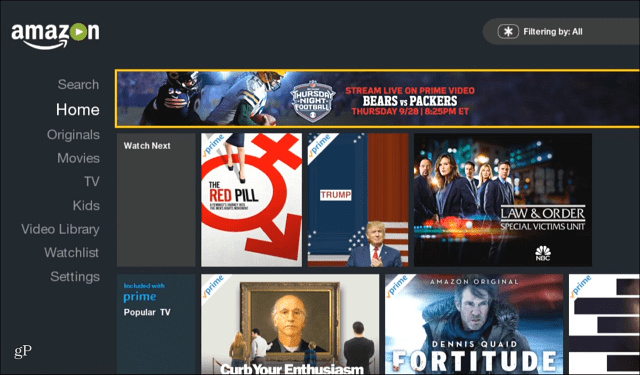 In our article about how to watch NFL football this year as a cord cutter, we mentioned that Amazon will be airing Thursday Night Football games this season. If you are an Amazon Prime subscriber you can watch 10 games this year on a wide array of devices. 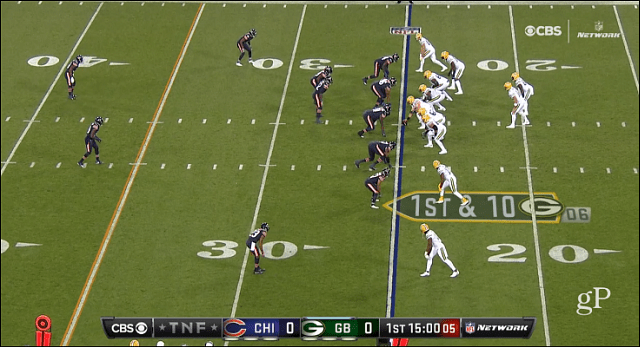 The first game (Bears vs. Packers) aired this past week. I watched the game on several different platforms and devices. Here’s a look at what my experience was and how you can find and watch the games on virtually any device you want. The games will be available to every device that has the Amazon Prime Video app installed. That means you have a vast choice of platforms and devices to watch it on—from mobile Android or iOS devices to Roku, Fire TV, or Chromecast to enjoy the game on the big screen. Although, at the time of this writing, there is no support on Apple TV as we’re still awaiting the arrival of the Amazon Video app. If you have an Amazon Fire TV or TV Stick, just navigate to the home screen with your remote and click the banner at the top advertising the game. Or, if you have your Fire TV paired with Alexa or have the Voice Remote you can simply say “Alexa, watch Thursday Night Football on Fire TV”. If you have an Echo Show you can say “Alexa, watch Thursday Night Football” and it will begin playing. Of course, you can watch it on your computer via your web browser, too. Just head to amazon.com/video and click the Watch Live button. 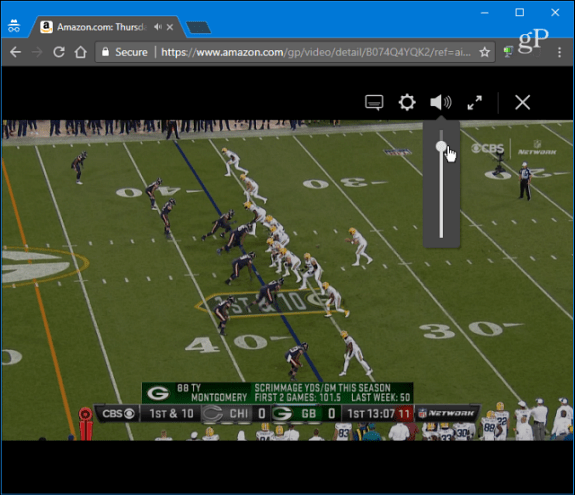 When Amazon won the rights to stream the NFL this year it seemed like the experience might be convoluted. After all, Amazon Video is great for binging on its original shows or catching movies on-demand. But it’s not known for a live video experience like other services such as PlayStation Vue or Sling TV. The company went all in with Thursday Night Football and finding the game is easy. You will find ads for the games all throughout the Amazon app on all platforms. While we’re only one game in, there were very few hiccups with the stream during the game. However, the interface is simple and basic on all platforms. NBC airs the Sunday night game online for free on its website and via the NBC Sports app. The web version provides extras like the ability to switch between different camera angles and real-time stats during the game. If Amazon is serious about airing the games in the future, and this isn’t just a one-off, maybe we’ll see similar extra features like that. Speaking of Thursday Night Football, it’s important to note that you will be able to live stream the CBS games via CBS All Access, too. Amazon’s deal with the NFL for Thursday night games isn’t exclusive. That means others can stream the games as well and CBS is one of the services to negotiate a rights contract. So, if you picked up a subscription for CBS All Access to watch Star Trek Discovery, you should also know that you can watch the live Thursday night games as well. Have you watched a Thursday night game on Amazon yet? Leave us a comment below and let us know what you thought of the experience. I was not able to watch it on my Roku. I had it on my Amazon watch list, and I could find it through the search feature on Roku, but it wouldn’t pull it up. I’m assuming I was doing something wrong, and I wish I knew what the issue is. I had the same problem with Roku. Why no answer from Brian Burgress? He asked for comments—well? I watched NFL with N F L S K Y .C O M and I think they have the best option to watch regular season too. I guess I am not sure why it wouldn’t work on Roku. You might want to try to uninstall the Amazon Prime VIdeo channel and reinstall. I was able to watch it on All devices including an old Roku 2. I just read the Amazon website and it says it only streams with Roku 3 and 4. I have a 2 so it’s interesting that the 2 worked for you. Otherwise I would think that was my problem. Were you guys able to watch the game tonight between the Patriots and Buccaneers? Tried uninstalling and reinstalling. No success. As of October 12 I still can’t watch on roku streaming stick. Been prime member for years. Added it to my watch list and it doesn’t even show up under watchlist. Have uninstalled and reinstalled, updated roku and Amazon prime video app. Still nothing. I have Roku and can’t find the game on Amazon prime. I can watch it on my phone but that’s not really how I want to see a football game. What am I missing? I have seen several complaints on Amazon about the Amazon Prime app not working for TNF on Roku as well as other platforms but Roku specifically. It works fine on my Roku 3 and my older Roku 2. For those having a problem getting it to work…which version of the Roku are you using? I have the Roku 2. What do you click on? I don’t have any banner or anything, just the genres, etc. I can’t find the link on my older roku. Which I think is a two. Anyone have any ideas?!? I’ve emailed amazon 3 times and despite assurances that the problem wouldn’t occur again, it has. I don’t know if the version of Roku is the problem but I’ve told them and they haven’t said that’s a problem. It’s frustrating.